Three Japanese universities (Waseda, Kogakuin and Showa) and robot maker Tmsuk have developed Hanako, a robotic dental patient who can behave like a human patient (to some extent). The robot, who is supposed to be female, can converse with doctors (“Please examine me!”, “That hurts!” etc. ), discharge robotic saliva, sneeze, open and close her mouth, etc. Standing 157cm tall, Hanako’s body is the work of Tmsuk, while the “medical features” were developed by the dental faculties of the universities involved in the development of the robot. There are nine joints in her body, for example in her jaw, tongue and even in her eyelids. 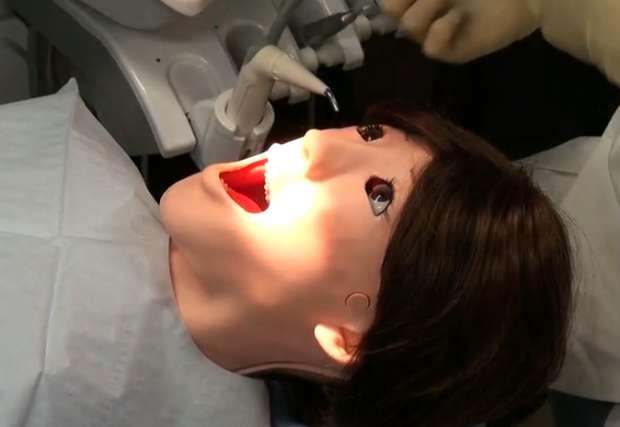 The main goal is to offer dentists or dental students a way to practice “real-life” procedures on a robot before taking care of human patients (at Showa University, dental students actually have to take tests using Hanako). This actually makes a lot of sense, I would say. Hanako reacts to mistakes by verbally expressing pain, rolling her eyes or even simulating a vomiting reflex, thanks to the touch sensors in her mouth.